The high quality case of typical late 18th century Lancashire style, constructed of an oak carcass with the finest flame mahogany veneers and exquisite boxwood inlays throughout. The boxed swan-neck pediment hood with finely carved rosette paterae and carved cusp to the centre, with pierced fretwork beneath. The boxwood inlaid hood door flanked by turned and crisply reeded columns. The beautifully figured curled mahogany trunk door of gothic design with triple point and turned acorn finial to the centre, with fan inlay to the frieze above, flanked by Chippendale style bamboo columns to the trunk sides. The book matched veneered base with boxwood shell inlay and stringing, with canted corner and complex stepped mould, all set on four ogee bracket feet. The beautifully executed arched japanned dial of “Wilson” manufacture, with Roman numeral chapter ring and outer Arabic numeral markings, with subsidiary seconds dial and “mouth” date aperture to the dial centre. Revolving phases of the moon to arch with opposing scenes depicting rural landscape and seascape with a finely painted ship. Classical “Wilson” decorated dial with raised gilt gesso borders with wild strawberry and flower painted corner spandrels. 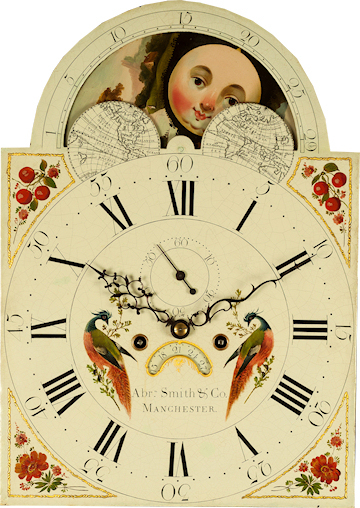 The dial centre painted with birds of paradise and signed Abraham Smith and Co Manchester. 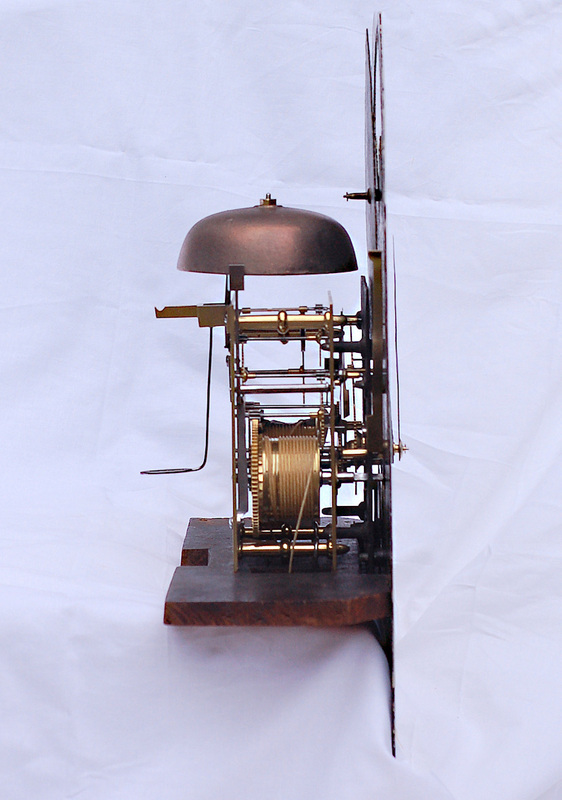 A fully restored fine quality eight day, four pillar movement, rack striking the hours on a single bell, with geared moon drive. Finely fretted blued steel hands of serpentine design.